NEW YORK, NY — On Tuesday August 7th from 6:30 pm until 11 pm, African and American Women in Entertainment, Business & Politics For Peace Through Youth Empowerment & Cultural Change (AAW-PEACE) will produce an invite-only benefit event at The Thompson-Smyth Hotel on 85 West Broadway, Tribeca, NY. The inaugural event for AAW-Peace, a global network of women committed to accelerating the pace of economic development in Liberia, will bring together 200 young professionals and non-profit with vested interest in infrastructure and economic development for countries in Africa. 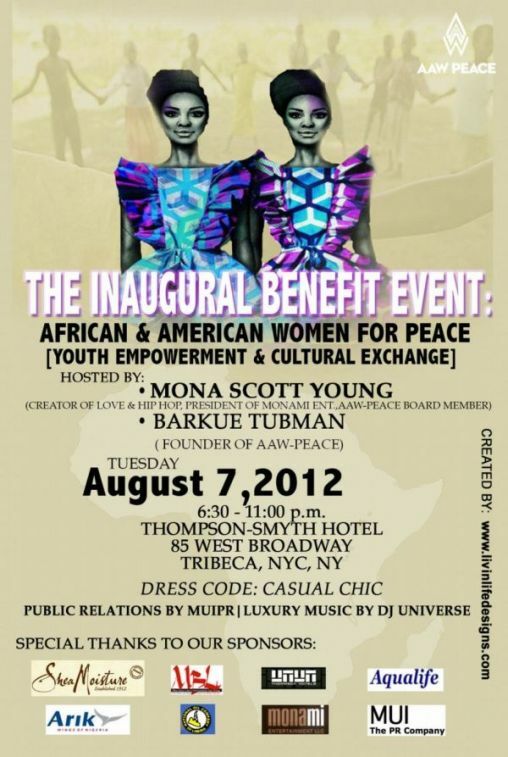 The event will be hosted by three powerful AAW-Peace stakeholders; Mona Scott-Young, President of Monami Entertainment, creator and excutive producer of the hit VH1 TV show franchise “Love and Hip-Hop” and AAW-PEACE Board member, Barkue Tubman, owner of MBL entertainment International and AAW-PEACE founder, and Shontelle, singer and song writer at Universal Music Group and AAW-Peace Global Ambassador. The exclusive benefit will also feature cocktails and hors d’oeuvres, AAW-PEACE swag bags, and music by Afro-Electronic Dance Music creator, DJ Universe. The affair will cultivate brand awareness for AAW-Peace by cultivating an opulent atmosphere for business professionals to exchange ideas about African youth development and impact. The launch will also help AAW-Peace generate funds to carry out its initiatives in LIberia. Every year, AAW-Peace organizes the ‘Dare to Dream’ conference chaired by Her Excellency, Madame Ellen Johnson Sirleaf, 2012 Nobel peace laureate, Africa’s first historic female head of State, and President of the Republic of Liberia. The conference attracts top industry leaders, celebrities and thinkers, all joining hands to inspire young people. The event is made possible by funding from Shea Moisture and the generosity of sponsors around the globe, including Arik Air, Africans in the Media & Creative Industries, MacDella Cooper Foundation, Monami Entertainment, National Oil Company of Liberia, Aqualife Water Liberia, and Toro Lounge at the Thompson-Smyth Hotel. A limited number of 50 tickets are available only by email: info@muipr.com. About AAW-PEACE: The African & American Women for Peace, Youth Empowerment and Cultural Exchange Network (AAW-Peace) is a global network of well-meaning women, committed to accelerating the pace of socio-economic development in Liberia, through the implementation of youth-focused programs in entrepreneurship, education, media, arts and culture. It is AAW-Peace’s goal to expand the minds of young people, by providing them the platform to experiment with innovative ideas, dream outside the box and grow above the confines of their present realities. AAW-Peace is driven by the fact that young people, when empowered to think creatively and independently, can develop their own, self-directed exit plans from poverty and dependency mentality. AAW-Peace organizes the annual Dare to Dream conference chaired by Her Excellency, Madame Ellen Johnson Sirleaf, 2012 Nobel peace laureate, and President of the Republic of Liberia. The conference attracts top industry leaders, academics, celebrities and thinkers, all joining hands to inspire young people. Connect with AAW-PEACE today to learn more.